This getaway is perfect for appreciators of historical artifacts and permaculture lifestyles. 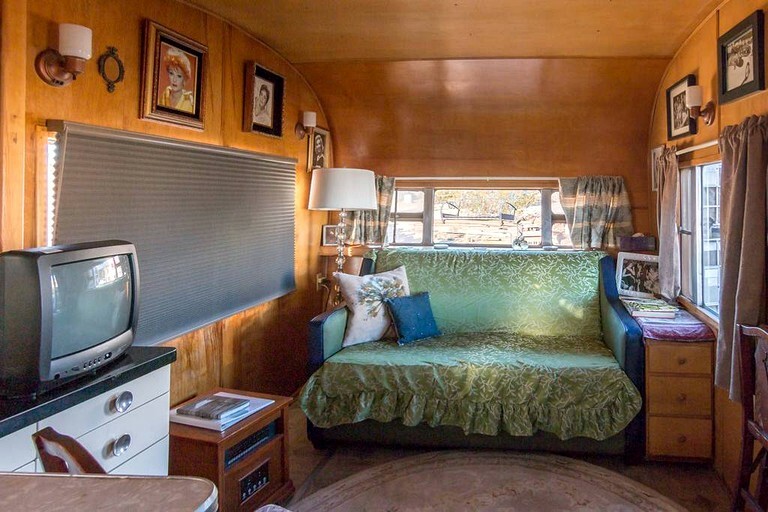 This retro trailer rental is situated near Joshua Tree National Park, California, and makes for a unique getaway for up to four guests. 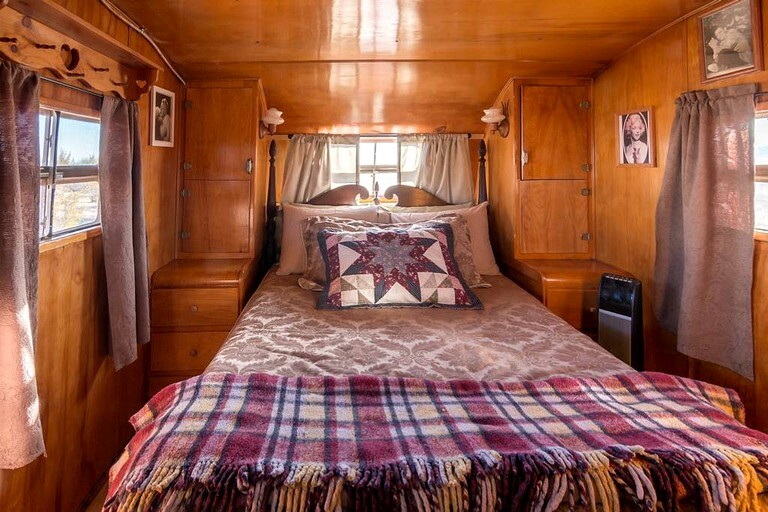 The trailer showcases a charming wooden interior and a delightful vintage décor throughout with a classic movie star and astronomy theme. 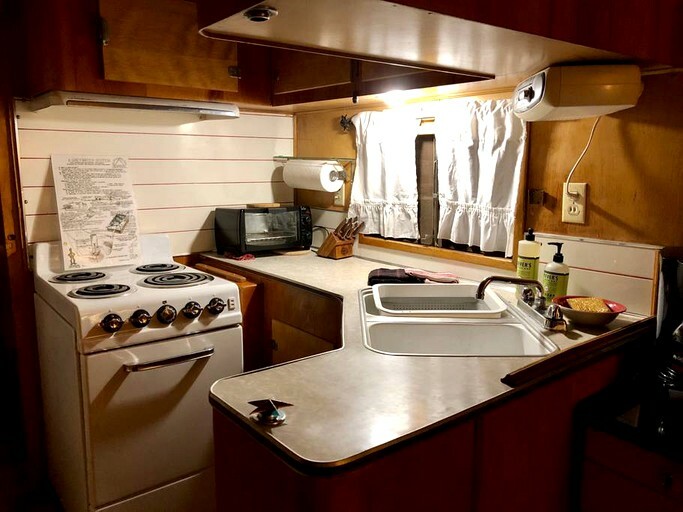 There is a cozy bedroom with a full-size bed that features quality bed sheets, dressers, and cabinets while the compact bathroom has a toilet, a sink, and a shower. Linens and towels are kindly provided by the host. 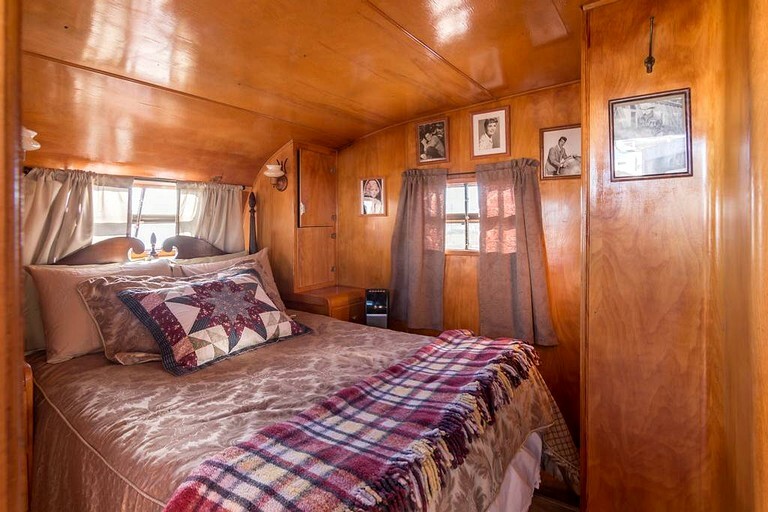 In the living area, glampers will find a comfortable sleeper sofa that can sleep two guests and a television. 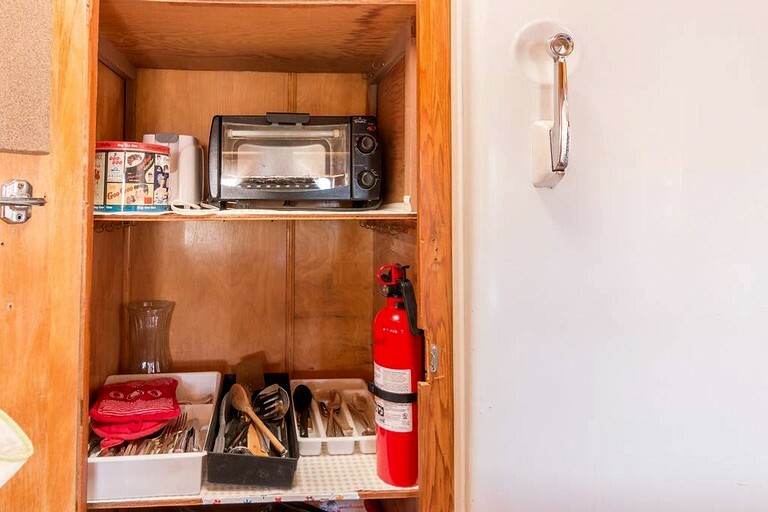 The stylish kitchen is equipped with an array of cooking and serving utensils and all of the appliances guests might need, such as an oven, a stove, an original Frigidaire, and a coffeemaker. 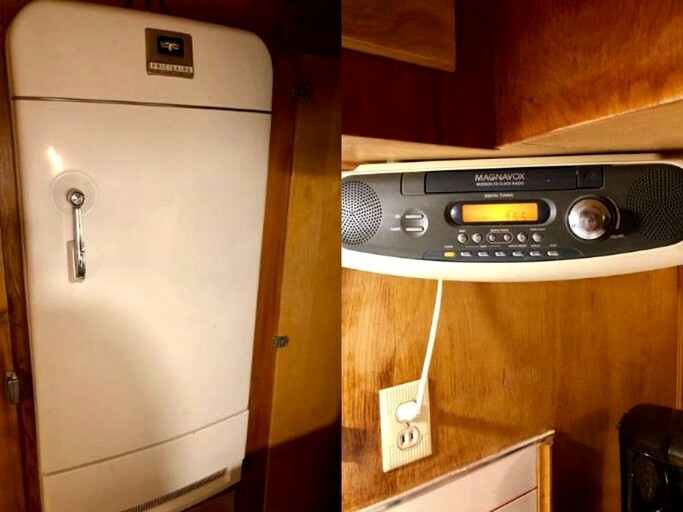 Other amenities include an evaporative cooler, free parking on the premises, and complimentary Wi-Fi. 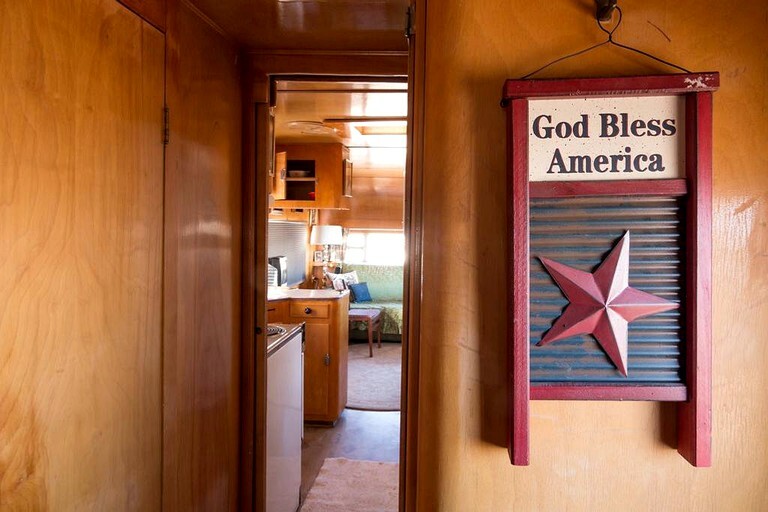 Glampers will be fully immersed in the tranquility of the desert landscape surroundings while still enjoying access to modern amenities and conveniences during their stay. 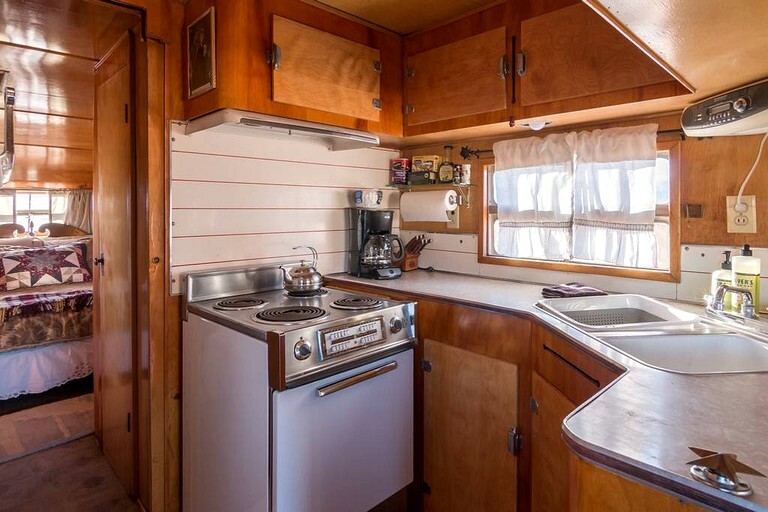 Each of the four vintage trailer retreats are fully furnished and equipped inside and out. 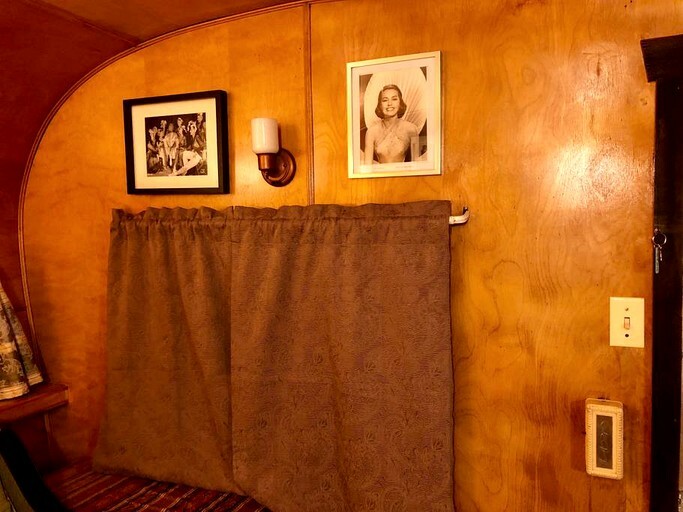 Two of the vintage trailers have an outdoor antique claw foot bathtub to cool off in and all the trailer properties are private with a private patio or a deck. 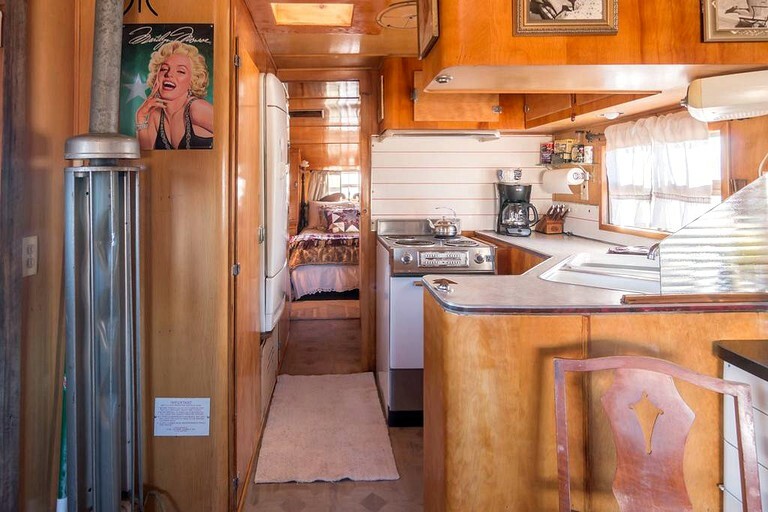 Each trailer has a movie library, a TV, and a sleeper sofa in the living area, while each also has a bedroom with a full bed. 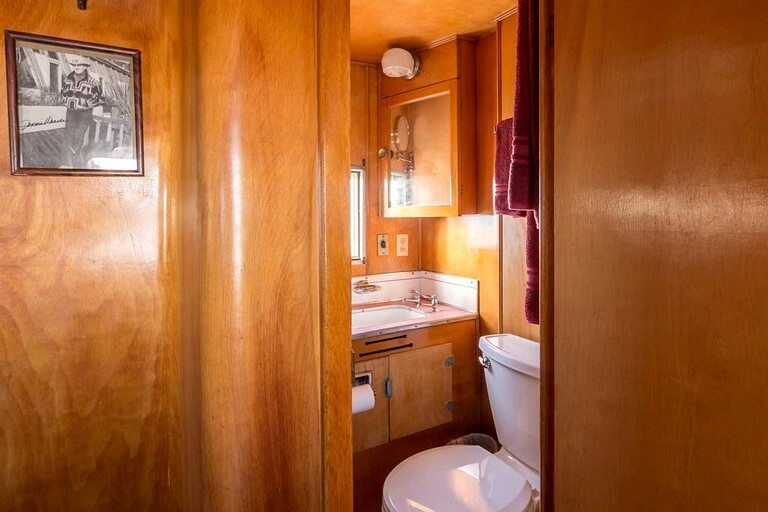 Two of the trailers each have a full bathroom with a bathtub and the other two each have a three-quarters size bathroom with a shower. 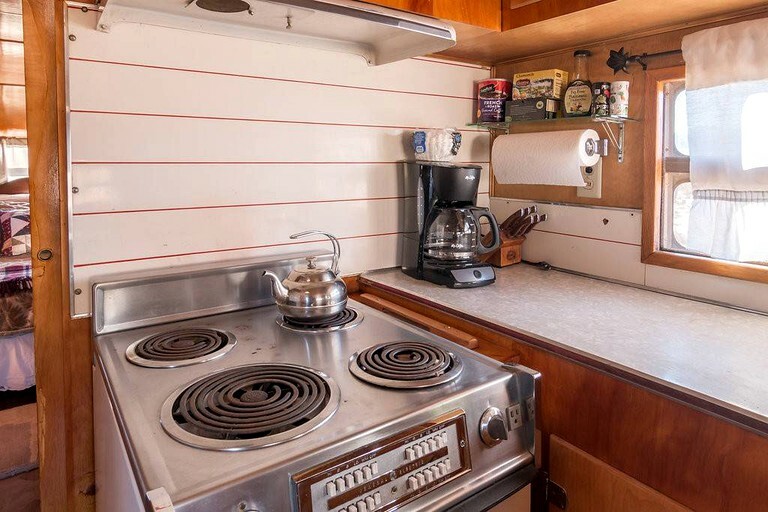 Each trailer kitchen is equipped with all the comforts of a traditional kitchen so guests can cook meals as they so choose. 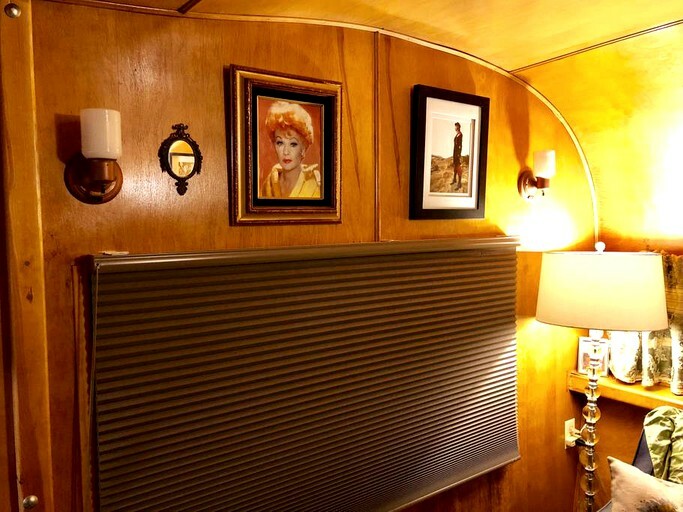 The trailer decor fits the theme of each trailer with an abundance of local flavor and antiques fitting the original vintage trailer style. The property purposefully features only solar pathway lights to reduce light pollution so glampers can better view the bright night sky. Other amenities include free parking in a private parking space, complimentary Wi-Fi, heating, and air conditioning/evaporative cooler. The communal area within the grouping of the vintage trailer retreats features a playground for kids and coming soon in the communal area is a Jacuzzi. 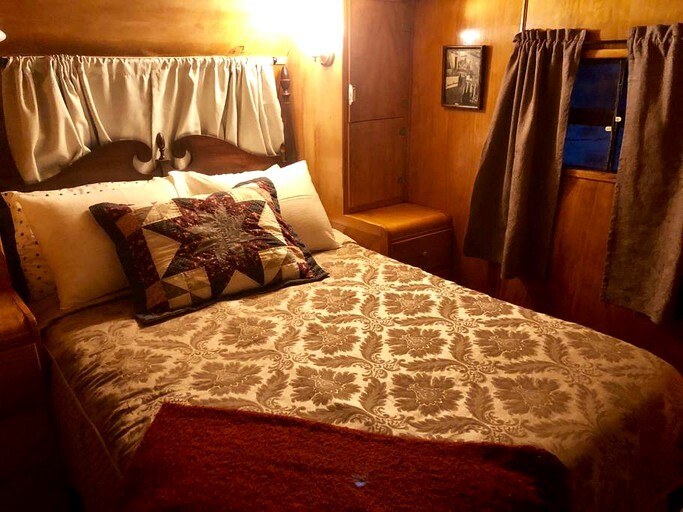 Guests can book all four trailers if they would like to hold a family reunion or a retreat for up to 16 registered guests or they can book one based on which one is their favorite theme. A penalty of $100 is charged if guests checkout after 11 AM. A penalty of $100 is charged if guests arrive for checking-in before 2 PM. A penalty of $100 is charged if there are unregistered guests on site. 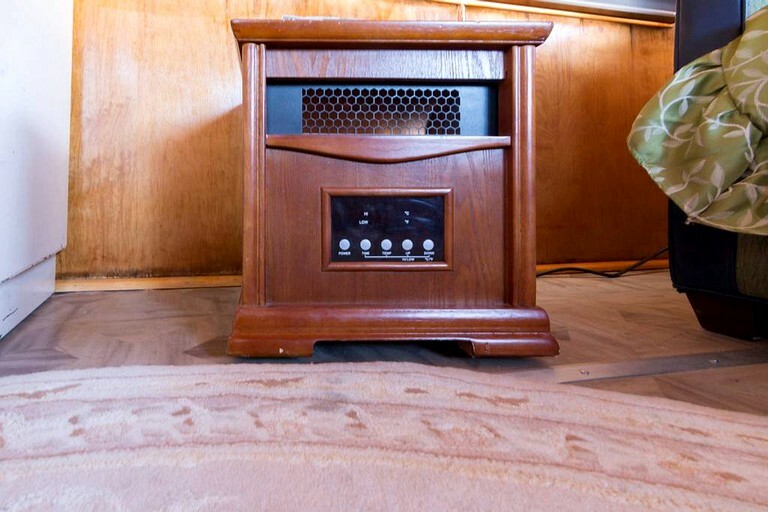 This retreat is ideal for appreciators of historical artifacts and permaculture lifestyles. 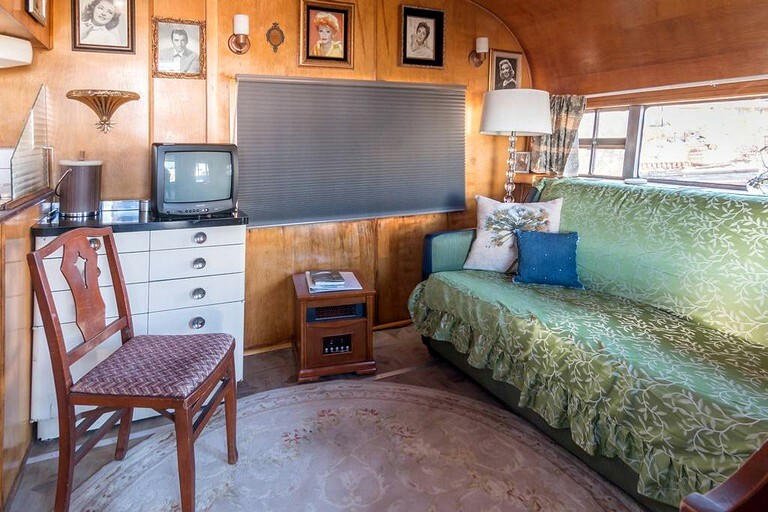 Each of the four vintage trailer retreats provide guests with a truly unique experience. 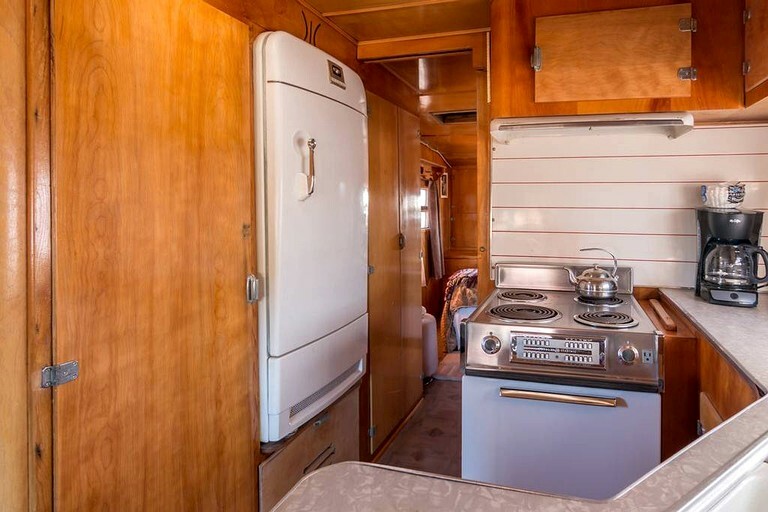 The getaways are tastefully decorated in the original 50's vintage style with antiques and decor suiting each trailer theme. 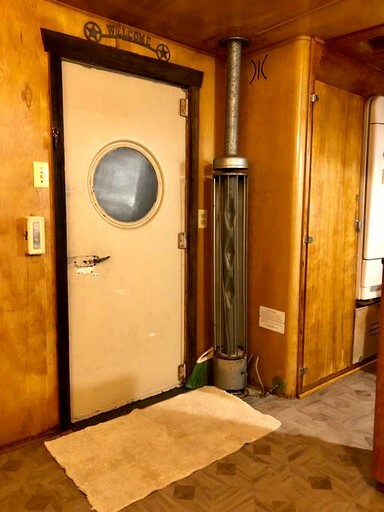 One has a sci-fi/outer space theme, another is western, the third theme is movie stars, and the final getaway is a Led Zeppelin-styled rental raised above ground level as though it floats in the air. 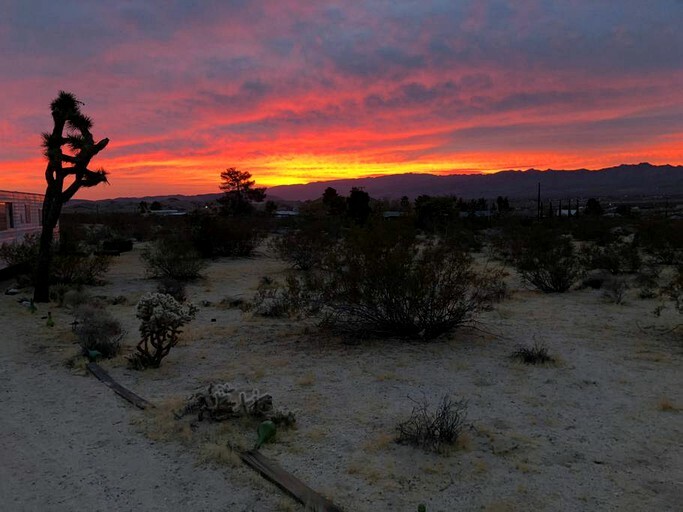 The ranch is situated on a five-acre parcel in the picturesque desert landscape of north Joshua Tree, California. 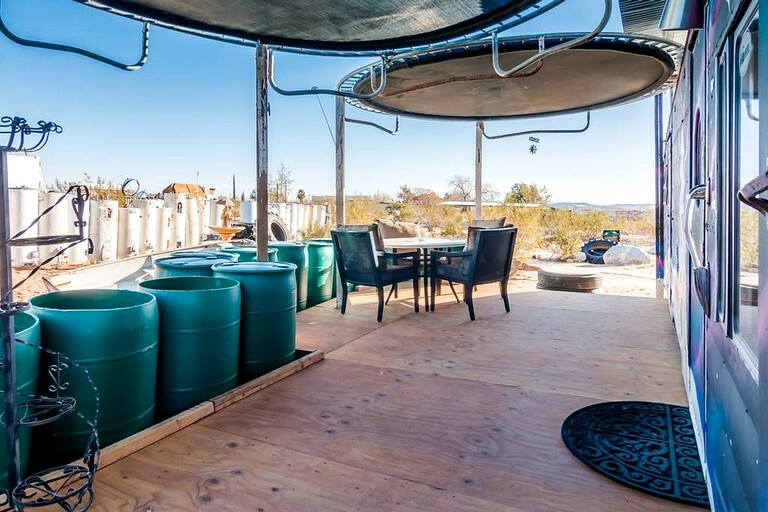 With easy access to the vast and abundant natural beauty of Joshua Tree National Park located just 20 minutes from the property by car, this is the ideal site for glampers seeking a true nature retreat in a permaculture setting with plenty of options for outdoor recreation nearby. Upon prior appointment, the host will be happy to provide a permaculture talk and tour of the property, explaining the solar power systems which generate the electricity, as well as the grey water systems that water the landscape. The hosts default to the belief that guests' visits are a getaway from it all and allow them to bask in the peacefulness of these surroundings, without interruption. 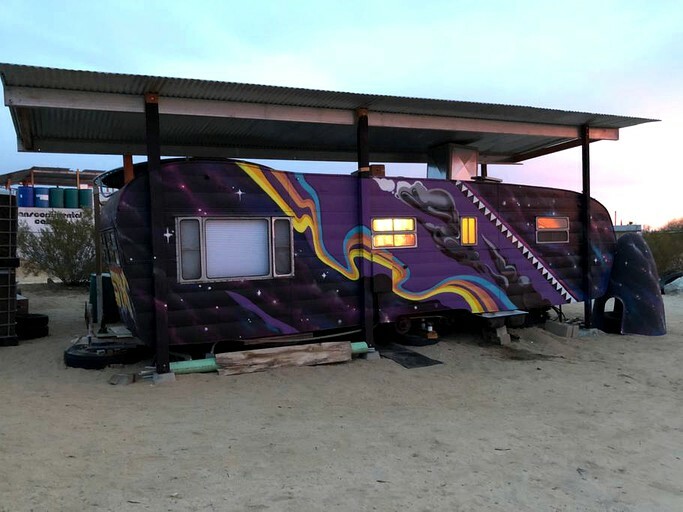 Glampers will be surrounded by hundreds of miles of scenic wide open landscape where they will view a mixture of unique rock formations, ancient trees, desert vegetation, and native wildlife. 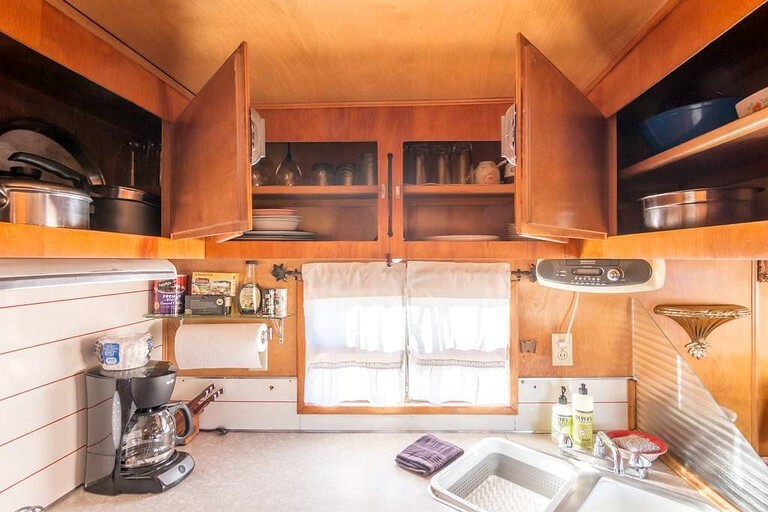 Guests can rent one trailer for a private stay for two, or rent all four trailers which could provide them with space for a family reunion or small desert retreat for up to 16 registered guests. 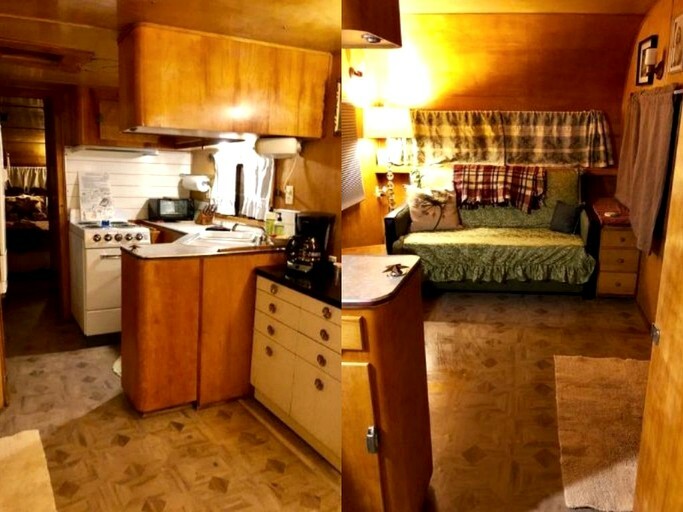 Nightly prices per trailer include the first two registered guests. Each additional guest up to four maximum per trailer costs $25 each per night. 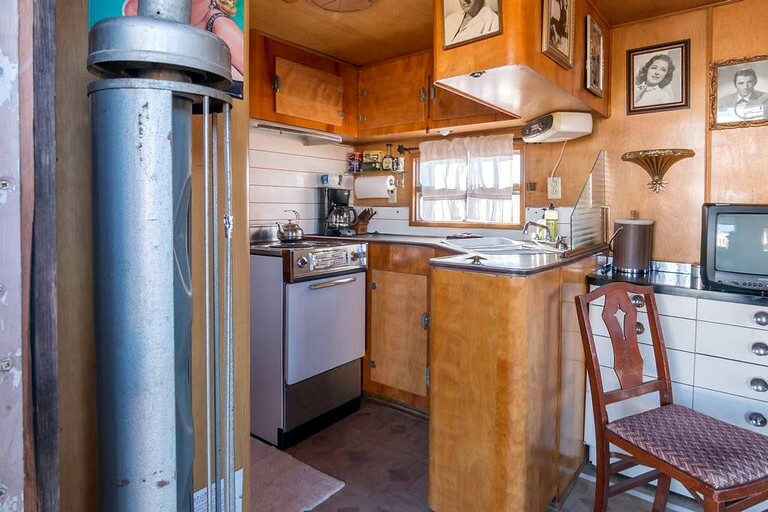 While the setting of this rental is secluded and feels like a remote desert paradise, glampers will be less than 10 minutes from the heart of the quaint and small downtown Joshua Tree marketplace. 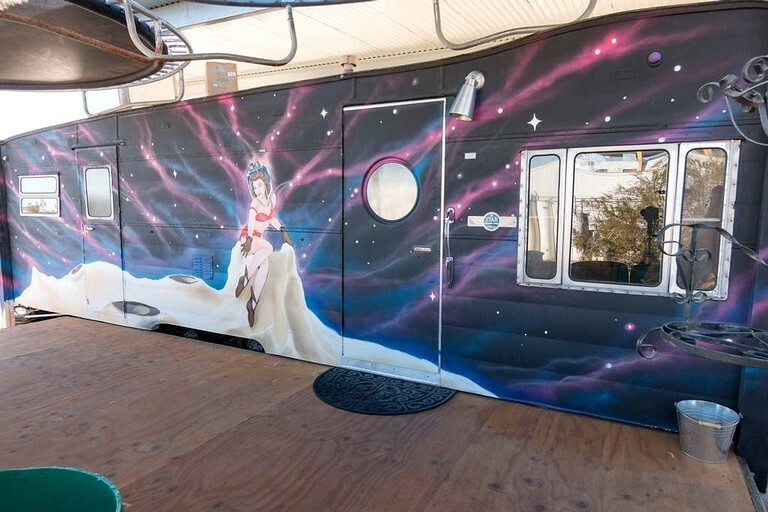 There, glampers will discover a thriving arts scene with an array of galleries and local shops, dining options, and music venues. Most events are posted publicly on social media which is a good resource for travelers in search of events during their stay. Regular local music at the JT Saloon includes open mic Tuesdays and blues Thursdays. All the JT art galleries are open at night monthly on the second Saturday. 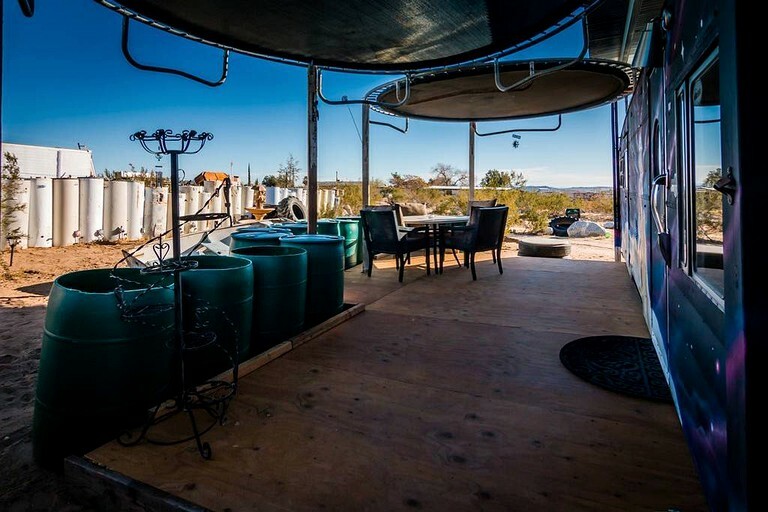 With such close proximity to the boundless natural attractions within Joshua Tree National Park, glampers will have a wealth of options for outdoor experiences to enjoy together. The vast network of trails within the park offer picturesque hiking and rock climbing experiences. 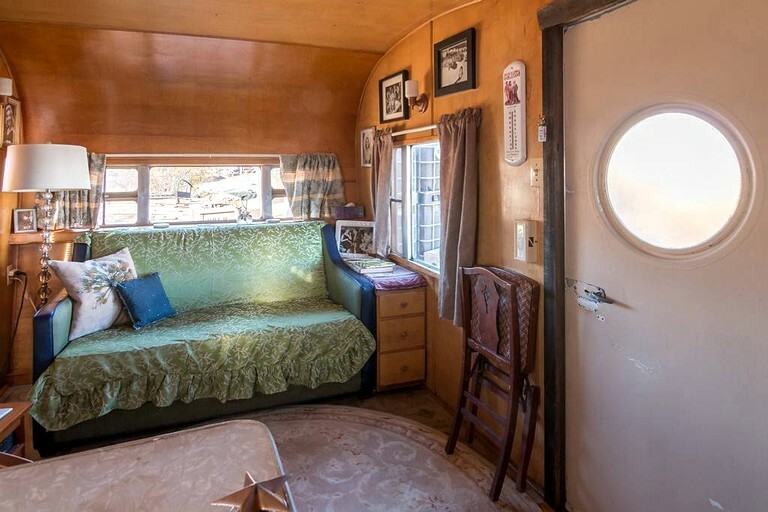 There are several nearby landmarks that glampers can visit including the Integratron, which is an acoustically-perfect structure and offers sound baths by advance appointments. Many events are posted locally on Facebook. There's also a new local events website called visitjt.org. Pioneertown is worth a visit as it is a famous Old Western town and movie set, also famous for its music restaurant Pappy and Harriets. Noah Purifoy outdoor museum is a mile from the site and is a must-see. Gubler Orchids is another great family-friendly attraction where guests can take a tour of the facility and enjoy its beauty. For a break from nature, glampers can head into town to discover the quaint art galleries and shops and dining options. On the second Saturday of each month, all Joshua Tree galleries are open at night. 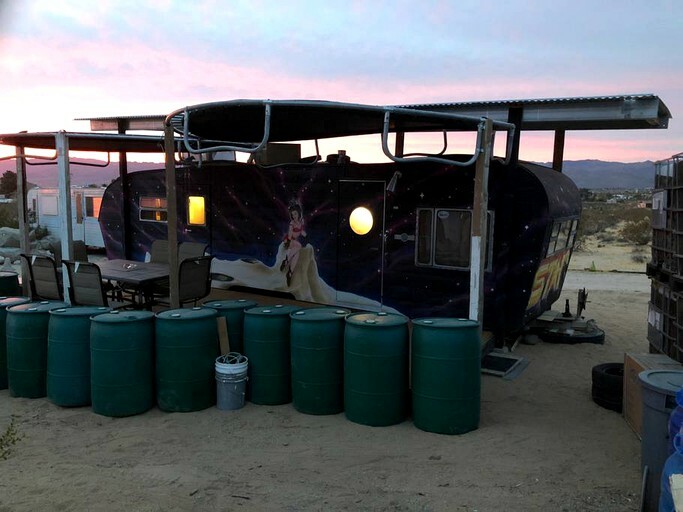 Joshua Tree Music Festival is a bi-annual event every May and October. The Joshua Tree Retreat Center offers multiple spiritual and yoga gatherings throughout the year, including Bhakti Fest and Shakti Fest. 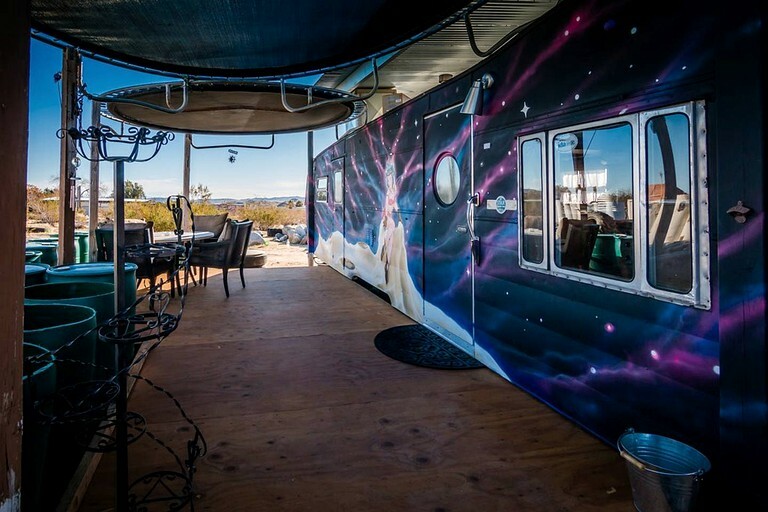 Highway 62 Art Tours also opens all personal and private art studios and artist homes throughout the Morongo Basin for two full weekends every October. Quiet hours are all the time and particularly between 10 PM and 7 PM. Guests should register the correct number of occupants!! The first two guests are included in the rate. Each additional guest up to four maximum is $25 each per night. 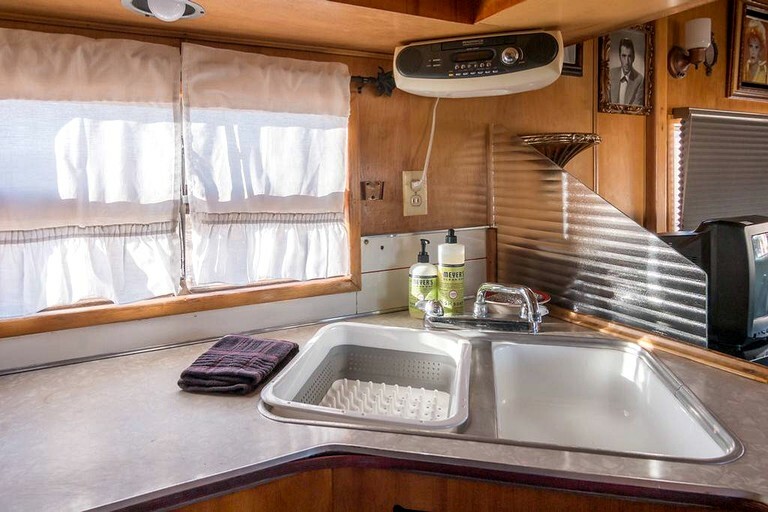 All the sinks except the kitchen right sink drain outside to water the plants, so guests should use the bio-compatible soaps that are provided and wash the dishes in the kitchen right sink which drains to the sewer. Climbing on top of trampoline shade covers, vehicles, or anything except the playground is not allowed; those are for shade purposes only. No burning is permitted, including smudging, incense or candles, camp or bonfires, or firearms. Smoking is permitted outdoors only. Ashtrays must be cleaned and butts must be picked up. Unregistered guests are not allowed ever!! Registered guests only are allowed on site. Any drop-off or pickup, such as ride-share services or taxis, must occur off-site on Belmont Street. A penalty of $50 is charged if guests checkout after 11 AM. A penalty of $50 is charged if guests arrive for checking-in before 2 PM.